You may make online payments to Dragonpay-accredited merchants using your Chinabank Online Internet banking facility. Choose Chinabank Online from the payment list of Dragonpay. You will be prompted to confirm your email address. Upon confirmation, an email instruction will be sent. Open the email and follow the instructions. Login to Chinabank Online. If you do not have an account yet with Chinabank Online, please contact Chinabank for assistance. From the main menu, choose Transactions >> Fund Transfer >> To Other Accounts. If you have previously added Dragonpay as a transferee, you may skip to Step 4. 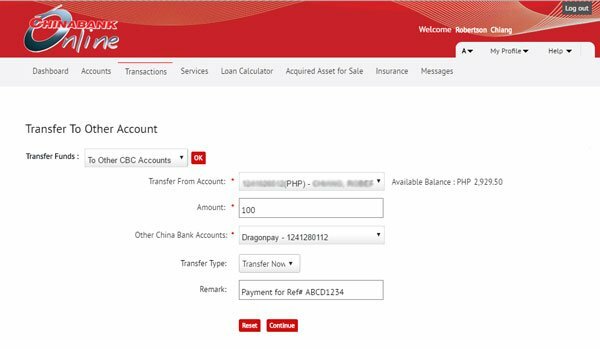 Otherwise if this is your first time to use Dragonpay with Chinabank Online, you have to enroll us as a transferee initially. From the main menu, Transactions >> Fund Transfer >> Manage Transferee. Enroll our Current Account Number 1241280112 with branch BBG-BOSD-CCOD-MAKATI CASH CENTER (if that does not work for you, try SALCEDO VILLAGE-VALERO). After clicking the Continue button, Chinabank Online will display a message about the need for a counter-party confirmation. At this point, you have to call Chinabank Customer Support Center. The bank officer will verify your identity over the phone to confirm the transferee enrollment. Once confirmed, you are good to proceed with Step 4. From the Main Menu, go to Transactions >> Fund Transfer >> To Other Accounts. Select your fund source account. Enter the exact amount due in your payment instruction. Indicate the Dragonpay bank account you enrolled in Step 3. For Remark, you can enter any text to help you remember what this transfer is about. This is only for your own use and has no bearing with Dragonpay. With the Transfer Type at Transfer Now, click the Continue button to proceed. Chinabank Online requires that all financial transactions use a transaction password for security reasons. This password is different from your login password. If you cannot remember what is your transaction password, please contact Chinabank. Enter your transaction password and click on the Submit button. 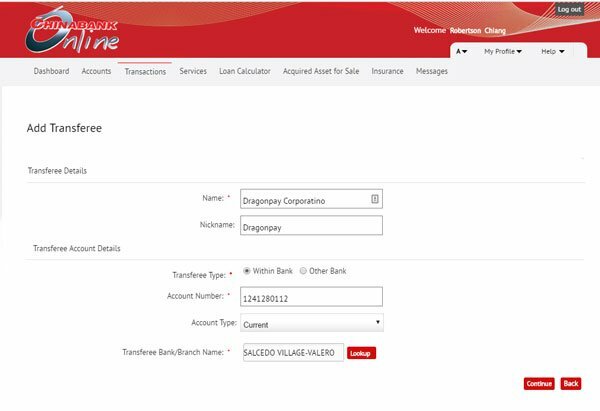 Chinabank Online shows a summary of the completed transaction. Take note of the Debit Account Number (your fund source). You may highlight and copy it onto your clipboard. Click on the validation link in item #2 of your email instruction from Step 1. You will be redirected to a page which will prompt for your source bank account number. Enter your bank account number and click on the Validate button to complete the process. 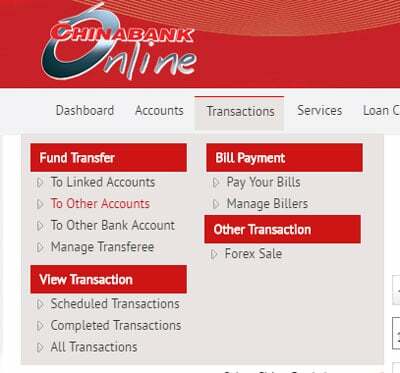 Chinabank Online payments are processed at end of day. If you do not receive a confirmation email from us by end of day, you may contact our Customer Support.